Syed Samad is a third year student at the University of Buffalo School of Pharmacy and Pharmaceutical Sciences. He believes professionalism begins with the relationship between a practitioner and his patient. In March 2013, he started as a pharmacy technician for Wegmans. He has a passion for community and global outreach and became adept in providing pharmaceutical care locally and globally. Along with his classroom coursework, he believes his participation in medical mission trips, community outreach, and internship at Kenmore Mercy Hospital have made him the student he is today. 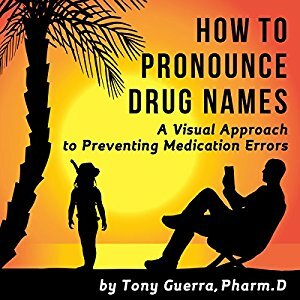 Audio: Welcome to the Pharmacy Leaders Podcast with your host, Tony Guerra. The Pharmacy Leaders Podcast is a member of the Pharmacy Podcast Network. With interviews and advice on building your professional network, brand, and a purposeful second income from students, residents, and innovative professionals. 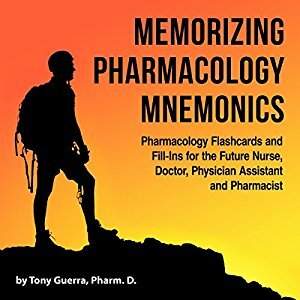 Tony: Welcome to the Pharmacy Leaders Podcast. As we move towards 2018, I want to send a special invitation out to students, residents, or fellows that are interested in creating a digital publication to do a guest interview. Contact me at aaguerra@dmacc.edu or TonyPharmD1 on Facebook messenger and tell me who you’re thinking about interviewing and we’ll talk about it as maybe a good idea for having a guest podcast episode, so that not only can you get a digital publication out there, but maybe there’s something innovative someone’s doing that we just haven’t heard of and that we should hear about. I’m really excited again to introduce our guest for today. Syed Samad is from the University of Buffalo College of Pharmacy, a great research university. He talks a little bit about the way that they set up Dean’s ambassadorships to not only help other people know about Buffalo but also to mentor other students. I hope you enjoy this episode. Syed Samad is a third-year student at the University of Buffalo School of Pharmacy and Pharmaceutical Sciences. He believes professionalism begins with the relationship between a practitioner and his patient. In March 2013, he started as a pharmacy technician for Wegmans, and he has a passion for community and global outreach and became adept in providing pharmaceutical care locally and globally. Along with his classroom coursework, he believes his participation in medical mission trips, community outreach, and internship at Kenmore Mercy Hospital have made him the student he is today. Welcome to the Pharmacy Leaders Podcast. Syed: Hi, thank you very much for having me here today. I’m very excited to talk about pharmacy and leadership. Tony: Well, tell me a little bit about your leadership road. Everyone’s leadership road is a little different. You told me that your work experience was actually a little bit nontraditional before you came to Buffalo. Syed: Yeah, I guess, I don’t know, nontraditional or maybe a little cyclic in the route. When I left high school, I’m going to be quite honest, I wasn’t always going to pursue further education. I ended up actually going to a technical school and getting a certification to be an auto mechanic. I worked, actually, for General Motors for about three years. About a year into it, though, I realized that’s not exactly what I wanted to do and ended up going back to school. Found my way from a community college to SUNY Brockport. Got a degree in biochemistry and was accepted to the School of Pharmacy and Pharmaceutical Sciences at University at Buffalo. What sparked that was not only my brother kind of being in the pharmacy field, but him helping me get a job at Wegmans as a pharmacy technician, where I kind of made those first initial interactions between a patient and pharmacy. That’s honestly where I feel professionalism lies, is through that relationship. It’s just kind of snowballed since then. As soon as I got to the school, there was many opportunities there. Things I especially focused on was community outreach, so volunteering and aspects of pharmacy, along with global outreach. Having the opportunity to do medical mission trips and overall just basically getting my hands into anything that I found interesting or remotely interesting just to see where I wanted to go. Because as many people, when they’re coming into pharmacy school, are not always aware of where pharmacy can take them. I just wanted to get involved in as much as I could just to see what I liked, what I didn’t like, and what I wanted to continue to pursue. Tony: Tell me how someone goes from auto mechanic to biochem undergrad major? There’s a big push throughout the whole country that we want to get people in STEM fields. What was it that made you say, “Biochem, yes, that’s for me,” because that’s going past inorganic, to organic, to then biochem, the application of organic. How did that happen? Syed: I guess that was more just on accident than as impressive as it sounds, because I tried actually doing biology and I liked certain aspects of it, but as some undergrads may already know, biology’s more of a language of its own, and it wasn’t for me. I excelled at it but I knew I wasn’t very passionate about it. While I was really interested in actually math and calculus, and then I saw chemistry, which was essentially just the application of science using mathematics. She definitely pushed me, and I would always say, if you’re ever uncertain, always ask your professors. Even if they don’t seem welcoming or would like to help, they always want to help even though that might not be your impression as a student. They’ve been through it before. You might be going through it the first time, but asking people who help students get to where they are, much like yourself, is how I think I went from being a mechanic to a biochem major. It was just asking people their opinions and making a shared decision with many, including my family and faculty members. Tony: So, we’re going to start with one of the leadership roads. You’re the Academy of Managed Care Pharmacy student, is it the AMCP treasurer? Tony: Tell me how you decided to kind of volunteer and become an officer within a group I think that, I remember Tyler Dolton from Auburn said that he just kept joining groups and just seeing if this fits. Even if you don’t decide to go into managed care, at least you get certain skills and relationships out of it. Tell me about that first leadership road that you took. Syed: Well, that was more of, kind of in the same way, just, I joined a lot of organizations but I wasn’t sure what I wanted to do. The thing that got me to managed care was actually one of my friends. She definitely influenced me to, like push me to become the treasurer, even though I wasn’t exactly sure that’s where I wanted to go, but she was like, “You want to do this. I know you’ll be good at it. I know it doesn’t seem interesting now, possibly,” but she was totally right. Although initially it didn’t seem interesting to me, I didn’t understand fully exactly what managed care was, like the fact that it’s taking monetary aspects of pharmacy practice and putting it to good use. That you’re basically the link between community chain pharmacy and health insurance plans, but at the same time, the impact in the inpatient setting with pharmacy and therapeutics committees is also there along with branching out and making formularies. It was just overwhelming when I actually got into it, and that’s probably what forced me more into that leadership role. As I got into it, I actually went and observed P&T meetings, our pharmacy and therapeutic meetings, and got to see how pharmacists at the table use their knowledge to make an impact on other patients. Tony: Tell me a little bit about now, IPSF. If you could first tell us a little bit about what IPSF is. I understand it’s sort of a part of APHA, and it works with other countries. We’ve had other students that are in it, but the first thing I want to do is kind of go over what it is, and then we’ll go over the value of it. So, first of all, what is APhA-ASP IPSF? Syed: Well, I guess, APhA, IPSF … APhA’s the big organization just like the AMA or the Academy of Pharmacists. The umbrella under there, IPSF, is the International Pharmacy Student Federation. It’s really, for us, it’s UB, that’s the organization where if you want to just help internationally, if you want to help your community, that’s where you would go. The biggest thing our organization does would be, it organizes all the mission trips through the school. We help a refugee move in. Generally, in the spring semester, we’ll help a family move in. We also do a lot of fundraising and volunteer work for the community. An interesting project that was started about a year, year-and-a-half ago, was the refugee education program. That’s also done through the IPSF organization. It’s really just more getting adept in different cultures and different patient populations that you might not always have the ability to do in a formal school setting. Tony: I’m familiar with religious medical mission trips, but explain to me what a medical mission trip is? Syed: Something that our school offers is actually secular trips and non-secular trips. It’s completely your choice, what you feel comfortable doing. For the non-secular trips and what I have gone on, it’s, I guess in the simplest terms, it gives you the opportunity to not only practice outside your scope but to also see things outside of healthcare in the US. It just really … You might leave as a person, but you definitely come back with a greater appreciation, I would say, as far as a medical mission trip goes that’s non-secular. Tony: Okay, so I’m going to just give you my very limited international experience. We went to Ireland. My wife had a back pain. We go into the pharmacist. They actually gave us Voltaren cream for like, 10 euros, and that was it. There was no doctor. There was no insurance. There was none of that. Can you tell us about your medical mission trip and maybe what is different about the country that you went to, and what practices you see there that are different than we have here in the States? Syed: The biggest thing I saw, at least in Haiti, we went to a small, rural area in what was called Fontaine, and we stayed at a school. Over there, there aren’t even healthcare workers. A lot is just relied upon, I guess, members of the society taking people to the city when they need severe help and they’re in distress. The biggest thing we did there was essentially a clinic to help everyone and anyone, where we had … It was a large group of us. There was about 35 of us. About 20 medical students, about six doctors, two pharmacists, two pharmacy students, myself included, and a mixture of PT, nursing, and non-medical help. We ran the clinic. We saw about 800 to 1,000 people a day. Tony: A day? With 35 people? Syed: With 35 people. It was long days. I’m not going to sugarcoat it by any means. You were getting up for breakfast around six in the morning, seven in the morning, and running clinic from 8:00 a.m. to about 5:00 p.m. Then you have the stragglers who might need extra attention. Tony: Okay, so what I guess I was getting to in Congress is that we’re kind of trying to say that, well, there are a number of underserved areas. When people think of New York, a lot of times they just think of New York City. In Iowa, we have 99 counties. Definitely the majority of them are underserved. Is that an issue in New York? Because you guys are in upstate. Are there underserved areas that are maybe outside of the larger cities? Syed: I can’t say any of the top of my head, but there definitely is, I would say, groups of people who although services are there, they’re not always accessible. So, that maybe due to not having insurance, or having specific providers you must see, or having primary care physicians’ offices that are so overbooked that you have to wait a month to go in for something that’s not urgent. Although we have … I’m not going to say New York state doesn’t have facilities use, because we definitely do, but I would say access sometimes is definitely the limiting factor. The bottleneck would be just the lack of accessibility for people to go to which primary care they would like to and schedule appointments when they can just due to an unnecessary amount of patients needing a primary care physician when there isn’t one. Syed: I guess the program in general is, you can be a first year, second year, third year. You apply in your first year. Really they take into account just what experiences have you had, and I guess yourself as a student and your willingness to help others, in all honesty. Because as a Dean’s student ambassador you do a multitude of things. You help with the admissions process. You might help with even sitting in on interviews. You have students that might reach out to you, high school level, undergraduate level, that are interested in the program but may have questions that not everyone always feels comfortable asking an admissions person. So, they can ask us comfortably without having that stigmatism of, “Oh, will they judge me, because I’m really just curious and I’m not sure.” Or, “I don’t want them to judge me and think I’m unintelligent.” We have that opportunity to meet out with interested students. We also have the opportunity to do what’s called peer mentoring where about an hour a week we’ll sit and if anyone needs help with any of their classes or extracurricular work, or even just not sure what they want to do or want some advisement, we’re there for them. It’s really run by Jennifer Rosenberg. She’s probably the glue that holds it all together, because it’s a decent amount of students and she does a very good job at letting us know this is what’s expected of us, and what we should really be promoting as far as the school is concerned. Tony: Tell me a little bit about Buffalo as a research university. A lot of times students will divide schools into small liberal arts versus research-intensive. Tell me a little bit about the opportunities you have at a research school. Syed: Well, yeah, UB is definitely a large, research-intensive school. In that sense, I came from a smaller undergraduate so the feel was a little different. My class sizes are about 100 to 130 students. The thing I really like is whatever you want to get involved in, you really have the opportunity to do so. Whether that be bench work in the lab. I believe Dr. Brian Suji, he does a lot of work with antibiotic resistance, so that’s an opportunity there. Or, if you were more into technical computer modeling type of research, that’s also allowed, because pharmacokinetics and pharmacodynamics is something that UB definitely prides itself on as available to you. Or, if you wanted to even do some more pharmacy practice related work, that’s available. I think that’s one of the biggest reasons students like coming to our school is that if you’re interested in something and you want to further your knowledge about it, although it might not be part of the PharmD curriculum, you have the opportunity to do so. The faculty is actually very welcoming and actually promoting, because they love doing research. That’s why they’re there at that school. They have a passion in mind and they’re pursuing it, and they have no problem in accepting students to help them along that way. Myself, I’m involved in two projects currently. One is affiliated with Buffalo General and is involved in dosing protocols of certain medications. While the other one is completely opposite end of that spectrum. It’s more community-related with adult refugee education and looking at how we can help better inform the refugees about just general health literacy and working the system, like the US healthcare system. As you said before, in Ireland, when you’re used to just going up to a pharmacy and getting some Voltaren gel or some antibiotic and you come to the US where that’s not even allowed, nor is it out over-the-counter, that’s definitely a culture shock on its own. That’s really what that program, the adult refugee education program, is geared towards, is giving people who aren’t aware exactly how healthcare functions in the US, a better understanding and answering questions that they have. Tony: Now, you’re going to be going into your appies, or APPEs. I’ve heard them called a bunch of different things. Tell me a little bit about how you want to spend your fourth year or what types of rotations you’re looking for to kind of further your ability to help these groups and then help the medical missions? Syed: Well, I think for anyone listening, the best thing is to get involved early. Since I have done that, going on to my APPEs, I have an idea of what I would like to do. I know have more of a residency focus, so I’m looking at more intense inpatient rotations, which would probably be involving rotating in an ICU setting. Now, I’m hoping to do them hopefully in Rochester. I’ve applied for them, so we’ll see which ones I get, but the ones I was picking out were more intensive care units and more transplant, just because I’m interested in that. Along with medical mission wise, I’m not able to do one as a APP rotation in another country. I wasn’t able to fit it in my schedule. When you get to that point you’ll understand. There’s a lot of factors going into which rotations you’re able to do and which rotations you’re not able to do. But as far as UB is concerned, they do have some international rotations. They have one, a very good one, linked with Taiwan and a hospital there. They also have one India, and also in Brazil they had one as well. Students, if they would choose to, and really do have a passion for medical mission trips, and would like to further that with a six-week rotation in those areas, they’re definitely allowed to do so. Myself, I wasn’t … I’m doing them outside of my APPEs, so my APPE focus is more inpatient related and research related, because you are able to do research APPEs as well, and that’s kind of where my focus is lying. Tony: Okay, so tell me a little bit about your hopes for residency. If you were going to do PGY1, I know this is a year-and-a-half away, but what would be ideal for you? What kind of a center would you be looking at, or what kind of opportunities would you be looking at with residency? Syed: I guess I’m a little biased, going to a research-intensive school. I would like to hopefully do a residency in a research-intensive facility as well. I would be looking more at larger places, at least in New York state, like Buffalo General, like SUNY Upstate, or even Strong Memorial in Rochester, where you have that ability to not only learn about how a large facility works, where you have multiple factors indicating of, oh, if we make a small change here, it’s going to affect our outpatient clinics, it’s going to affect our pediatric clinics, and so on and so forth. When I’m looking towards residencies, I’m definitely looking more for a larger institution where I’m able to learn basically anything and everything. Pediatrics, geriatrics, cardiology, neurology. I have an idea of what I want to do in the future but I think getting exposed to as much as you can as a student is definitely the most beneficial. Tony: Okay, so just three questions to round this out. You seem like you’ve got a lot of extracurricular activities, and then you’re also keeping your grades up in all of this. What is it you do on a daily basis to keep your work on track? Are you a list person, or how is it that you manage to fit all of these things in? It sounds like you’re doing the work of two students. Syed: I’m sorry. Go ahead. I was going to say, as far as extracurriculars go, it’s more just making time for it. At least at my school, they always offer free food for coming to clubs and things, so instead of making dinner, I go and get pizza. So, that was definitely a benefit of doing those type of things. Tony: Okay, so you’ve obviously listened to a number of mentors, had some great mentors at UB, but tell me what’s the best career advice you’ve ever had or you’ve ever given. Syed: Okay, this is actually not from any of my mentors. It was actually, I asked a question at my interview. I applied for the Wegmans internship, pharmacy internship. I had the store manager actually sitting in on that interview. I asked him a question. His response actually has helped me definitely throughout my career, so far, is, he said, he told me, because I asked him how he got to the position he’s in today, he told me that to get to positions where you want to be, you should try and be the best at the position you’re at now. If you’re a cash register person, be the best cash register person you can be and look forward from then on. That’s how I’ve taken the mentality as a student. When I was a first-year student, residency and fourth-year rotations was not on my mind. My focus was to learn the information and to be exposed to different fields because I was in my first year. In my second year, third year, and so on, that’s kind of how I’ve taken it. Now, as a second-year student, your focus is heavily in academics so that at least it tends to one of the more challenging years. As a second-year student, I knew that I had to focus more academically. As a third-year student, I knew that I have not only the time but the opportunities to branch out more, and that’s what I did. I guess the best advice I’ve ever gotten is, whatever role you’re in currently, be the best you can be at it, and then focus on moving forward. Don’t look forward and try to do things now to get there, but rather do the best you can at where you’re at now and the success will come. Tony: Okay, and the final question is, what inspires you? Syed: What inspires me? I guess, that would, probably, I would tie back more to my family. My parents, they weren’t immigrants, but they immigrated to America in probably the late 80’s. Their work ethic, the challenges they have faced, have definitely been one of the biggest motivating factors for myself to succeed and excel. Because if they can come from another country, barely speak the language, and find success, what’s limiting me? I was born here. I should have, I have all the tools necessary. I think that’s honestly one of the benefits of being an American, is that we have so much opportunity given to us and it would be foolish not to take advantage of it. I would say that’s probably what motivates me the most. Tony: Okay, well, thanks so much for being on the Pharmacy Leaders Podcast. Syed: Yeah, and thank you for having me. 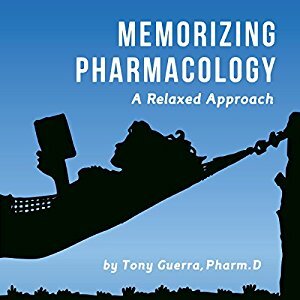 Pharmacology: A Relaxed Approach.” With over 9,000 sales in the United States, United Kingdom, and Australia, it’s the go-to resource to ease a pharmacology challenge. Available on Audible, iTunes, and Amazon.com in print, e-book, and audio book. 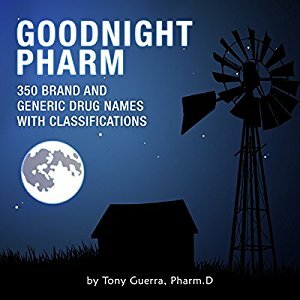 Thank you for listening to the Pharmacy Leaders Podcast with your host, Tony Guerra. Be sure to share the show with a hashtag, #pharmacyleaders.